Furnished apartments for rent in Toronto are out there to fill a void. People who travel need a place to stay and most of the times dislike staying at hotels since they are uncomfortable. This is where Toronto accommodations can be made easy. This contemporary fully furnished one bedroom suite is roughly 630 square feet, way larger than any average hotel room, and it includes a balcony. The unit showcases rich red hardwood floors, and an open concept layout. The kitchen is stocked with all the utensils you would need on a daily basis and all the appliances are functional. A trendy dining table with three chairs is ideal for eating the meals you prepare. There is also a desk right off the window for all your study or work related needs. The living room has a comfortable leather couch and a flat screen TV mounted on the wall, so you can lay back and relax. Speaking of which, you can do the same in the queen sized bed that is dressed with 300+ thread count linens. Inside the bedroom is also a walk-in closet, the bathroom holds luxurious towels. A bi-weekly cleaning service comes by to clean the sheets and towels you use during your stay. At the same time, there are en-suite laundry facilities so you can wash your own clothes as well. The building has exceptional amenities including an indoor pool and a fitness facility which you can see through the glass. There are locker rooms and saunas as well. Golf lovers are in luck, there are an outdoor putting green as well as interactive indoor virtual golf. Grill masters can show off their skills on the BBQ terraces, and take the food in to one of the 2 party rooms. For more entertainment there is a billiards room, media room and a card room. If you would prefer to cuddle up quietly with a good book, there is a library too. 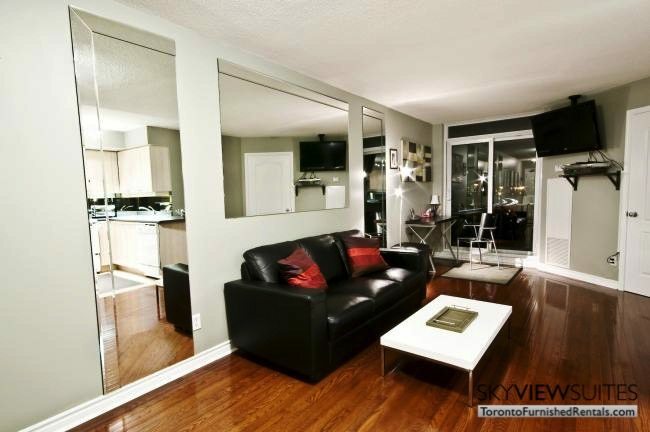 The New York Towers location offers Toronto short term rentals in Uptown Toronto. With direct access to the subway line, easy access to downtown, yet no need to pay downtown prices. The building is also positioned across the street from Bayview Village, one of Toronto’s most affluent shopping centers. The 440,000 square foot Centre is located at Bayview and Sheppard Streets in Toronto. It is home to over 110 luxurious and exceptional retailers selling the latest fashion trends. 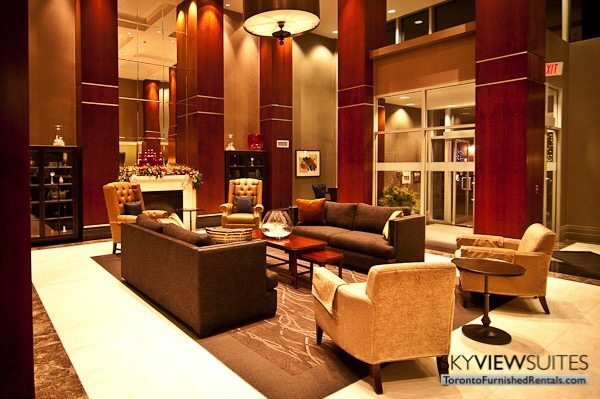 Bayview Village has an extraordinary vibe; home of the details include granite, beautiful tiles, and chandeliers, all throughout the centre. Ample seating is available throughout for you to rest while hearing classical music playing. Fine restaurants can be found here too. 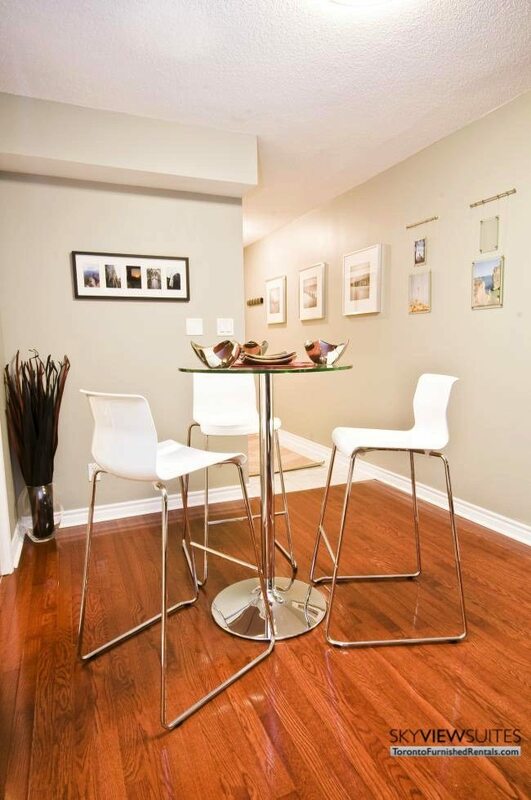 To make your Toronto accommodations at this location, click here: Furnished Rentals.